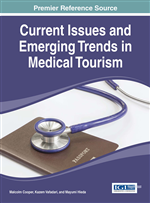 This chapter reveals the role of medical tourism (MT) in emerging markets, give an overview of tourism, medical tourism, and emerging markets; discusses the advancement of medical tourism in emerging markets; the significance of medical tourism in emerging markets; and the characteristics of medical tourism in emerging markets. The execution of medical tourism is essential for modern organizations that seek to serve suppliers and customers, enhance business performance, reinforce competitiveness, and gain ordinary success in emerging markets. Thus, it is essential for modern organizations to consider their medical tourism applications, create a strategic plan to consistently investigate their dynamic promotion, and instantly respond to the needs of medical tourists in emerging markets. Understanding medical tourism will significantly improve organizational performance and achieve sustainable competitive advantage in emerging markets. This section gives an overview of tourism, medical tourism, and emerging markets; the advancement of medical tourism in emerging markets; the significance of medical tourism in emerging markets; and the characteristics of medical tourism in emerging markets.